The U.S. Constitution established a federated republic in the United States, which was structured according to a separation of powers—executive, legislative, and judicial—each with its own specific duties and powers. 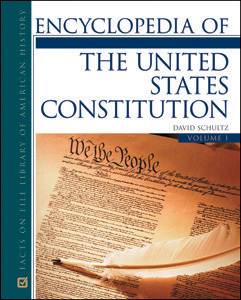 In more than 700 entries, Encyclopedia of the United States Constitution contains all the material high school students need to understand the United States Constitution. This two-volume A-to-Z set covers the people, court cases, historical events, and terms relating to one of the most studied political documents in schools across the country. Appendix material includes the U.S. Constitution and other government documents. "Recommended for libraries that serve persons interested in this topic." "...[an] excellent resource...clear, concise, and unbiased entries..."
"This title should be considered by all high school and middle school libraries."